NEW FOR 2019! 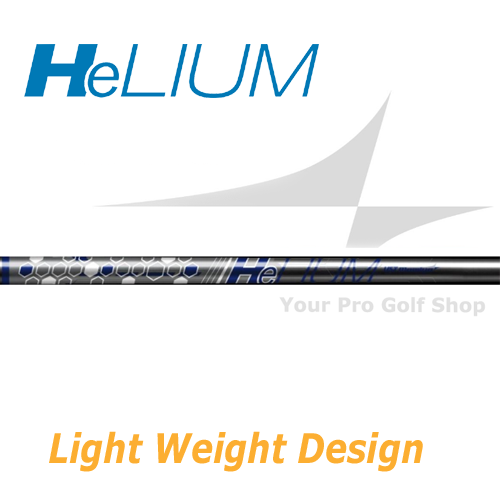 HELIUM IS DESIGNED WITH PREMIUM MATERIALS FOR ALL GOLFERS LOOKING FOR A LIGHTWEIGHT STRUCTURE WITH EXTREME STABILITY. Helium wood shafts are a light weight design using materials in innovative ways for the best in feel and stability never seen before in light weight structures. This is for the golfer seeking to maximize distance with longer builds and incredible control. We are able to reduce additional weight by using 25% less resin. Lowering the weight but also adding stiffness for stability. The shaft is counterbalanced to work well with today's heavier driver heads. We are able to increase stiffness without sacrificing feel for all swingers. In addition to using lower resin carbon fiber material, we added more carbon fiber in key areas for additional stability and improved shot dispersion.